People tend to have their go-to method for cooking asparagus, and for most people, that method is steaming. No matter how you usually cook asparagus, try one of the methods below and find a tasty new way to prepare these delicious green stalks once known as the food of kings. No matter how you cook asparagus, you'll want to either trim the asparagus or peel the asparagus stalks before cooking! 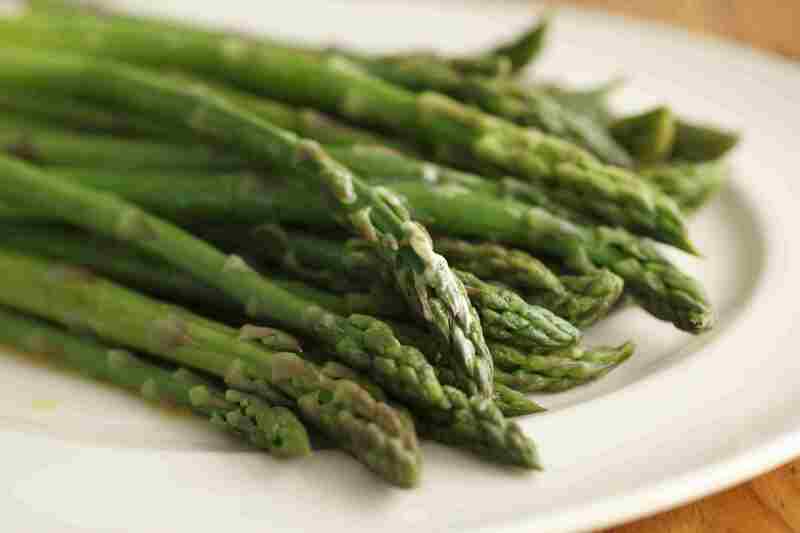 Blanching, or briefly submerging vegetables in boiling salted water, can be a wonderful way to cook asparagus, despite the unappetizing image of overcooked, gray, boiled asparagus. By cooking asparagus quickly in truly boiling water and then fully chilling it in ice water, you can "set" the green color. It's the perfect way to cook asparagus that will then be served chilled. Bring a large pot of salted water to a boil, drop asparagus in and cook until just tender, anywhere from 1 to 4 minutes depending on thickness. Drain and put asparagus in ice water until fully cool. Remove asparagus from ice water and pat dry. Grilling asparagus is a wonderful way to preserve its grassy flavor—and add a bit of smoky edge in the process. Simple toss trimmed or peeled asparagus spears with a bit of vegetable oil and put them on a hot grill. Cook, turning to brown evenly, until tender, about 10 minutes total. Sprinkle with salt and/or lemon juice and serve hot or at room temperature. Microwaving asparagus cooks it in a way similar to steaming. To Microwave asparagus: Set asparagus in a microwave-safe baking dish, add 2 tablespoons of water, cover, and microwave on high until tender, 2 to 3 minutes. Let stand, still covered, another 3 minutes or so. Pan roasting is part steaming and part sauteeing and gives you the browned edges of grilled or roasted asparagus without the hassle of heating up a grill or oven. Heat a bit of cooking oil or butter in a large frying pan over high heat. Add asparagus, cover, and cook, shaking the pan now and again, until asparagus is browned and tender, about 10 minutes. Asparagus makes delicious pickles, perfect alongside cured meats, in sandwiches, or as stirrers in Bloody Marys! How to roast asparagus: turn on the oven, put asparagus in the oven, cook until brown and tender. Seriously, it pretty much is just that easy—just add a bit of cooking oil to the asparagus to keep it from drying out in the oven. Sprinkle with salt and maybe a squirt of lemon juice before serving, if you're so inclined. Cooking asparagus over high heat while stirring often leads to tender, bright green bites and brings out the nutty edge of asparagus's mainly grassy flavor. This method works best with asparagus that has first been cut into 1- to 2-inch lengths. Heat a wok or large frying pan over high heat, add cooking oil and when it is hot enough to shimmer a bit toss in the asparagus. Cook, stirring pretty much constantly until asparagus is tender and browned on the edges, 3 to 5 minutes depending on the thickness of asparagus. If you want to include garlic, green onions, ginger, or other aromatics, add them right before adding the asparagus and let them sizzle for just a minute before tossing in the asparagus. Asparagus is usually steamed as whole stalks, but it can be steamed cut into bite-size pieces if you like. Whether you steam it whole or chopped, place asparagus in a steamer rack and set over boiling water. Cover and cook until asparagus is tender, 4 to 8 minutes depending on the thickness of the asparagus stalks. Steamed asparagus is frequently served with a bit of butter and salt. Traditionally it is napped with a bit of hollandaise sauce. Our favorite way to serve it is with a light vinaigrette and sieved or grated hard-cooked eggs.